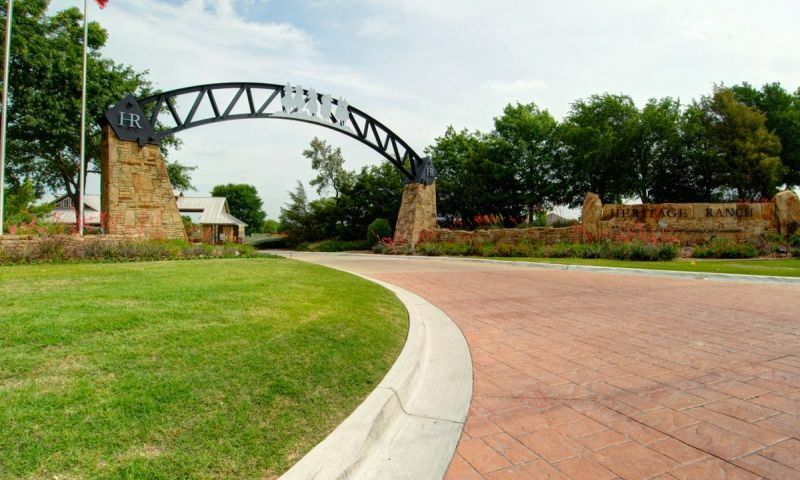 Heritage Ranch in Fairview, Texas is a 50+ active adult community located in the town of Fairview, northeast of Dallas. Its 1,144 homes are situated on a 575-acre country setting, surrounded by rolling terrain, wooded areas, creek beds and scenic ponds. This community also features an 18-hole, par 72 championship golf course designed by Arthur Hills. Developed between 2000 and 2007, Heritage Ranch is just five minutes east of Highway 75 on Stacy Road. It is convenient to the Village at Fairview, a mixed use center featuring dining, shopping and entertainment also close to major medical facilities and regional cultural centers. The center of this gated community is the 24,000 square-foot clubhouse which offers continuous activity for residents. The ballroom, billiards and card room, arts and crafts room, and a library with reading and A/V materials and computers allow for studies, relaxation, and socializing. A well-equipped fitness center and an indoor lap pool offer a variety of exercise options. The Corral Grill restaurant and lounge is a favorite spot for lunch and dinner, with an extensive menu for all occasions. The Corral Grill hosts special events such as Sunday brunch, formal dining, buffets, and prime rib specials and offers take-out service. It is also available for private party or club events. For more casual gatherings, the Outpost is the spot for the golf and tennis crowd, as well as for neighborhood socials and special events. Outdoor amenities include four lighted tennis courts, horseshoe and bocce ball courts, an outdoor pool and four miles of hike and bike trails through the woods and around the lakes, skirting the greens and fairways of the golf course. Offering several tee placements, the Heritage Ranch golf course can be enjoyed by golfers of all ages and skills can be practiced on a wide driving range, putting green, chipping area and sand trap. A professionally-staffed golf shop enhance the golf experience for residents and guests. Construction at Heritage Ranch in Fairview, Texas started in 2000 and ended in 2007. Homes are available on a resale-only basis. This community is made up of 1,144 single-family homes and attached villas available in 21 different floor plans, built by K. Hovanian, Lennar and US Homes, and ranging in size from 1,307 to 3,351 square feet. Homes typically feature two to four bedrooms, two to three bathrooms and a two to three-car garage. Most houses at Heritage Ranch feature outdoor patios on the back of the home, which quickly become the meeting place for neighbors. Other options available on certain homes are three-car garages, wide doorways, granite countertops, and golf cart garages. Association dues are include yard maintenance for the villas, and there is a required monthly food and beverage minimum per lot. Residents at Heritage Ranch enjoy an active and entertaining lifestyle. The wide variety of clubs and groups including chorale, theater guild, book reviews, art classes, yoga, Zumba, water aerobics, bridge, and much more. There are a variety of social groups and activities that cater to the many interests of the residents. A full-time activities director is on staff for classes, workshops, trips and other activities. Heritage Ranch is a perfect place to call home for the active adult. Fairview, Texas is a town in Collin County and a suburb of Dallas, located in the northeast portion of the Dallas/Fort Worth Metroplex. While Fairview maintains a rural style atmosphere, it offers plenty of shopping and dining and entertainment. Shopping includes major retailers Macy's, J.C. Penney and Dillard's as well as many specialty stores. Dining options range from fine dining to burger and fries on the patio while entertainment can be found in the form of Splitsville Bowling, Ipic Theater and Down Under Pub. Dallas itself has too many exciting destinations to list. Among the best shopping, restaurants and nightlife, it also has many free attractions. Some of the most noteworthy are the Art Garden, Dallas Central Library, African American Museum, Farmers Branch Historical Park, Dallas Symphony summer concerts, and Fountain Place just to name a few. It is easy to see why retirees and active adults are migrating to Heritage Ranch in North Texas. Clubhouse - 24,000 Sq. Ft. There are plenty of activities available in Heritage Ranch. Here is a sample of some of the clubs, activities and classes offered here. The Villas are arranged in duplex configurations. There are four models to choose from that range from 1,307 to 1,821 square feet. Homes feature two to three bedrooms, two bathrooms and a two-car garage. The Classic Collection includes five single-family floor plans that range from 1,540 to 2,382 square feet. Homes feature two bedrooms, two bathrooms and an attached two-car garage. The Legendary Collection includes eight single-family floor plans that range from 2,152 to 3,002 square feet. Homes feature two to four bedrooms, two to three bathrooms and a two to three-car garage. The Estate Collection includes four single-family floor plans that range from 2,630 to 3,351 square feet. Homes feature two to four bedrooms, two to three bathrooms, and a two-and-a-half to three-car garage. Got chance to meet a group for dinner here and ended up getting the full tour! It is a beautiful community and the views from the clubhouse are amazing. If I were 55+ and lived in Dallas I would live here in a heart beat! Love the setting here. Gorgeous views from the clubhouse and they have beautiful homes. This is an outstanding place to live and the lifestyle is exactly what we were looking for. Neighbors look out for one another and this is the best place we have ever lived. Heritage Ranch feels really private. There are lots of mature trees and you can tell it's a well established community. We've been here a few years and are pretty happy with everything. Some things at the clubhouse could use some updating like the pools and the gym. 55places.com is not affiliated with the developer(s) or homeowners association of Heritage Ranch. The information you submit is distributed to a 55places.com Partner Agent, who is a licensed real estate agent. The information regarding Heritage Ranch has not been verified or approved by the developer or homeowners association. Please verify all information prior to purchasing. 55places.com is not responsible for any errors regarding the information displayed on this website.